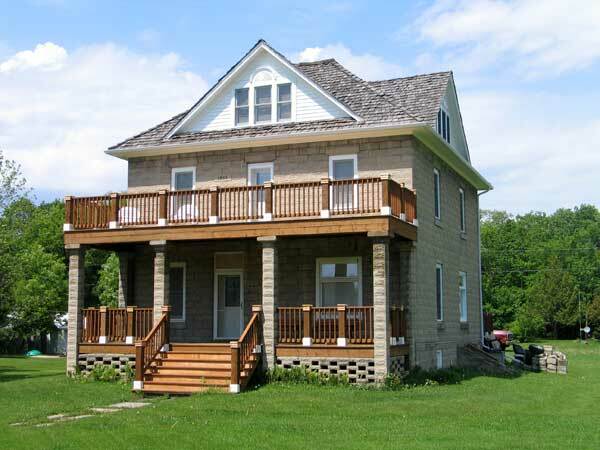 The former Presbyterian Church Manse in Emerson, in the Municipality of Emerson-Franklin, was constructed in 1905. The moulded concrete block structure was built by Emerson contractor David Wright using a concrete block-making machine that he bought from a catalogue. Wright erected several buildings in Emerson constructed from that material during 1905, including the Baptist Church and Casselman House. It is said that he stopped making block buildings when his mould broke. Concrete blocks, a material used throughout Manitoba, enjoyed a brief period of popularity in the early 20th century. Emerson was once a hotbed for the construction of concrete block buildings, and many rose throughout the town between 1900 and 1910. Presbyterian Church Manse, Manitoba Municipal Heritage Site No. 96, Manitoba Historic Resources Branch. We thank Wayne Arseny for providing additional information used here.